Using your GI Bill benefits to earn a degree or professional certification can change your life. Unfortunately, veterans need to proceed with caution, though. For-profit schools have a history of stretching the truth to persuade veterans to enroll in their programs and waste their GI Bill benefits on bogus programs and useless degrees. The government has scrutinized for-profit schools ever since it came to light that more than one-third of all dispersed GI Bill funds were going to for-profit colleges, and the veterans enrolling in these programs ended up deep in student loan debt for degrees that many employers considered inferior to state schools or other non-profit institutions. Certain websites, like the website GIBill.com, were even intentionally targeting and misleading veterans in what was essentially a money-making scheme, which eventually resulted in a lawsuit. Since the lawsuit against the GIBill.com website settled, the VA now manages the website, “to promote the GI Bill program and educate service members about the benefits available to them under the program.” The term GI Bill is now a registered trademark of the United States Department of Veterans Affairs, and all respective social media handles with the term now belong to the VA as well. Along with ownership of the term GI Bill, President Obama’s April 2012 executive order puts more rigorous protections in place for veterans and their families who use their GI Bill benefits. Unfortunately, for-profit schools and swindling programs still exist, so veterans and their families need to tread carefully when deciding to sign on the dotted line and hand over their GI Bill benefits. Fortunately, as a result of the government’s crackdown, it is now more difficult for institutions and programs to intentionally mislead veterans or cause them to misuse their GI Bill benefits. The VA in collaboration with the executive order has helped make many more VA and government resources available to veterans. 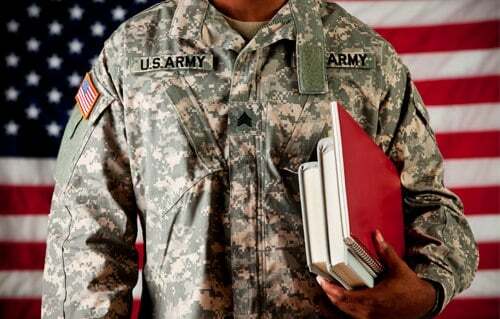 Use these tools and links to help you choose a reputable school or training program for your GI Bill benefits. Due to the fact that there are so many factors to consider, the VA published a fairly comprehensive guide to choosing a school. Use this valuable resource as a checklist or create an outline of all of the things that you’re looking for in a program before signing on to use your GI Bill benefits. You can also use the VA’s WEAMS Institution Search tool which helps you to find colleges, universities, flight schools, apprenticeship programs, vocational institutions, and other educational facilities whose programs are approved for VA benefits. To use the school locating tool, simply enter your desired search terms, and then click on the map to see the available results by state. The Federal Trade Commission also published a guide to Choosing a Vocational School, which can be a little bit different than attending a traditional college or university. Not all on the job training and apprenticeship programs qualify for GI Bill benefits, so do your homework before signing up and realizing you may have to pay out of pocket. What’s the total cost of the program from start to finish? Do I pay per course, per semester, or all at once for the whole program? Are there fees for switching classes? Will federal loans cover the costs of books, equipment, uniforms, lab fees, or graduation fees? Will this school’s program align with my career goals? Will I earn the credentials I want with this program? Start a dialogue with the college, ask them these questions, and don’t just take their word for it. Ask for them to provide the proof behind their promises. Look for stats and figures on the history of that program’s retention and graduation rates. Try to find a program that has an established history of working with veterans and their GI Bill benefits. If the administrative office doesn’t know the first thing about how to get you started with using your benefits, then you’ll definitely want to choose a different program. Always be on the lookout for diploma mills. Remember to keep away from programs that offer flat fees for a concrete amount of time with little to no coursework. Also, any programs that advertises for no exams and no classroom interaction is most likely part of a diploma mill. All legitimate programs with valid degrees take at least some time (usually no less than two years for a bachelor’s degree) and substantial coursework. There are a few options to check into the legitimacy of an institution. You can use the U.S. Department of Education’s Database of Accredited Postsecondary Institutions and Programs or the Council for Higher Education Accreditation’s database. Just because a certain program may not be listed in the databases does not mean it’s not wholly reputable, though. Some institutions have chosen not to pursue accreditation. If the school or program you wish to attend isn’t listed as an accredited institution, call the school and speak to someone in the admission’s office. Ask them why the school doesn’t have accreditation before making any decisions. A good bet for getting the most out of your GI Bill would be to pick one of the roughly 3,600 institutions that have agreed to follow the guidelines of the Department of Veteran’s Affairs Principles of Excellence Program. Schools within this program have a designated point of contact specifically for veterans to offer financial and academic counseling. Principles of Excellence programs will provide potential veteran students with an education plan and an accurate total cost of the program. They will ensure accreditation of all new programs prior to enrolling a veteran as a new student. These programs also accommodate active service members and reservists who may need to defer their classes due to service requirements. Use the GI Bill benefits comparison tool to see if the school you are interested in attending participates in the Principles of Excellence program and to determine what your GI Bill benefits would be while attending that school or program. To use the tool, simply input your military status, which GI Bill benefits you’re thinking about using, the cumulative term of your military service, and then, input a city or school. If possible, enroll in a program that follows Principles of Excellence. If you can’t find a school near you or one that has the degree or program you wish to take that participates, though, do your research before enrolling in a school that isn’t necessarily approved by the VA.
Never commit to any college, institution, or training program unless you have fully done your research into the reputation and requirements of that program. Always ask questions and ask for the proof to back up their answers. Don’t sign away your GI Bill benefits for a program that doesn’t align with your career goals and won’t get you to where you want to go. One thing about the GI Bill that will continue to result in veterans getting a degree from a degree mill or crappy for profit school is the way that housing allowances are paid for post 9/11 veterans especially for those that want an advanced degree. Going to a school that as a resident (actually attending classes in person) “pays” much better than attending a school online. Resident full time students can receive over $2,000 a month while distance learners only receive less than $800. Transitioning service members obviously want to replace as much of the entitlements as possible so many of them choose to attend University of Phoenix (UOP) due to the benefit increase. However a degree from UOP is not the best degree that you can receive, especially if you are going for an MBA or any other Master’s degree. It is no cheaper to live in Southern California attending class in person or online. Until a better way of paying those that want to go to a better university than UOP there will be a large portion of people going to a lesser educational institution in order to make the money now. I started at UOP for this reason however I quickly learned the the education I was receiving was not as good as I could get as they were not teaching me anything above and beyond what I received during my BS in Technical Management. I am on hiatus from furthering my formal education at this time. However, sometime next year I will be applying to a few MBA programs as schools such as Penn State, UNC, and ASU as their MBA programs are much stronger and should improve my employment opportunities much more than an MBA from UOP ever would. I earn $2566 in retirement after deducting taxes, SBP, TRICARE, & VGLI. I receive $2177 a month in VA SC disability. I also use the Post 9/11 GI Bill to receive $2701 a month for 9 months a year. Earning $81,243 a year is not bad! I retired in 2016. I was an E-7 with 24 years/one month and and get a 10% increase in retirement due to earning a Soldiers Medal. I was rated 90% by the VA and I am attending UMUC while residing overseas.